Is there a better alternative to iCloud Extractor? Is iCloud Extractor really the best app in Backup category? Will iCloud Extractor work good on macOS 10.13.4? iCloud Extractor provides the solution to extract the iCloud backup including photos, videos, contacts, etc. to your Mac or an external hard drive in a breeze. By freeing up the iCloud storage space, it enables its users to back up the iPhone or iPad to iCloud when there is not enough room. Instead of ponying up more for iCloud storage, iCloud Extractor saves more space and money for you. iCloud Extractor needs a rating. Be the first to rate this app and get the discussion started! After signing in to iCloud with your Apple ID, iCloud Extractor automatically reads and lists all the backups from your iCloud account. You start by choosing a backup point to extract the data from. iCloud Extractor will display your backup data including camera roll, photo stream, app photos and videos, contacts, text messages, notes etc. By extracting the iCloud backups to your Mac computer or external hard drive, you can make those data freely accessible. And that also keeps your vital data safe and manageable. Apple provides just paltry 5GB of iCloud storage for free, and that can get tight quickly. When you don’t have enough storage on iCloud, you can’t back up your iPhone, or iPad until you have extra room. 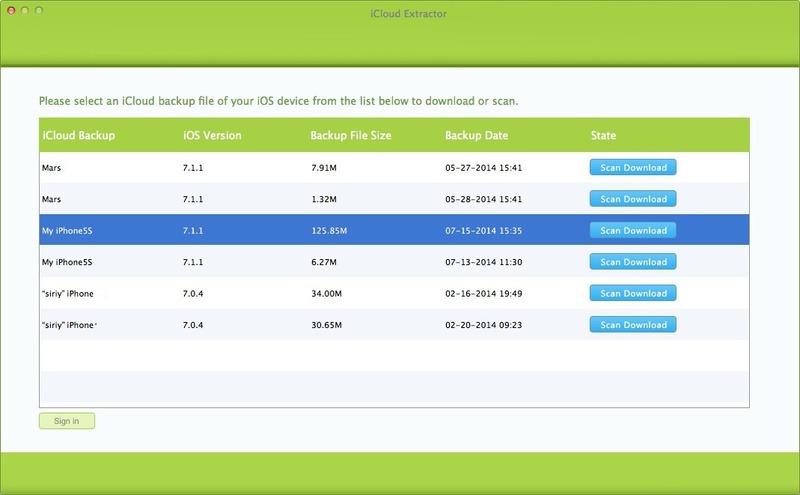 After extracting your iCloud backup with iCloud Extractor, you can delete the unnecessary backups to reclaim precious storage space. When you reach or exceed your iCloud storage limit, you can remove the backup files you don’t need before paying Apple for more. Not just space, iCloud Extractor saves more money for you!